By the mid-1850s it was apparent to Mint officials that the large copper cents struck since 1793 were too cumbersome and unpopular, as well as increasingly uneconomical to make. The idea of fiduciary coinage, based on the trustworthiness of the issuing authority, not on the coin's intrinsic value, was beginning to catch on as well. Sooner or later the "big coppers" would have gone the way of the dinosaur, but it was the large numbers of small Spanish colonial silver coins in use throughout the United States, that finally made it imperative that smaller cents had to be struck, and not necessarily of pure copper. It was Mint Director Snowden's desire to see all foreign coins driven out of the channels of commerce in the United States. The coinage law passed by Congress on February 21, 1857 gave him the means to do so. In addition to abolishing the half cent, the law also specified that the new cent would weigh 72 grains and be composed of 88% copper and 12% nickel. But the most important provision as far as Snowden was concerned was the one that required the Mint and the Treasury Department to convert Spanish double-reales, reales and medios at the rate of 25, 12-1/2, and 6-1/4 cents, respectively. All other government offices would only convert these three denominations at the rate of 20, 10, and 5 cents. With such a powerful profit motive, banks were very desirous of exchanging as many of the foreign silver coins as possible for the new "nicks," as the Flying Eagle cents were called. When the Flying Eagle cents were first released on May 25, 1857, more than a thousand people wound around the mint building to convert their old Spanish coins. A secondary market developed immediately, some people even paying a premium right on the grounds of the mint building itself. 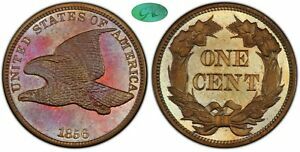 Soon enough, though, the "nicks" became commonplace, and by 1859 when the Indian cent design was introduced, the Mint had struck a total of 42,050,000 cents with the Flying Eagle design, more than enough for anyone who wished to have multiple examples. Snowden was successful in driving out the now demonetized Spanish coins, and by 1859 it was estimated that some $2 million worth of the foreign silver pieces had been recoined into U.S. subsidiary coinage. Designed by James B. Longacre, the Flying Eagle motif was actually an adaptation of the Christian Gobrecht/Titian Peale design used on pattern dollars twenty years before. The reverse wreath was similarly adapted from the model Longacre had made for the 1854 one and three dollar gold pieces. As with other Longacre designs, the relief was too high. This caused problems on fully struck coins, they would not stack properly, and on less than perfectly produced pieces it created problems associated with die opposition, that is, either the eagle's head and tail did not strike up fully on the obverse or the wreath was ill-defined on the reverse. 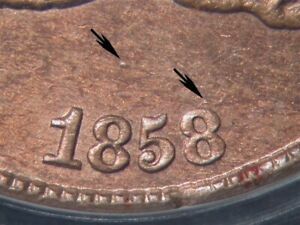 On coins dated 1857, weak reverse definition is especially prevalent. Grading Flying Eagles can be somewhat tricky because of the above-mentioned weakness of strike encountered on many examples. The points of the design to show wear first are the eagle's breast and wingtips on the obverse and the bow on the reverse. On mint state coins that are weakly struck on the head or tail of the eagle or on the reverse wreath, it is imperative that mint luster be present on all areas of the design. Flying Eagle cents have been extensively counterfeited. Fakes have been made by altering digits in the date, false dies have been produced to strike phonies and spark erosion dies have been used. 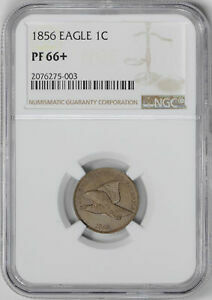 When in doubt or when purchasing a high priced Flying Eagle cent, it is always best to have the coin's authenticity expertly verified. 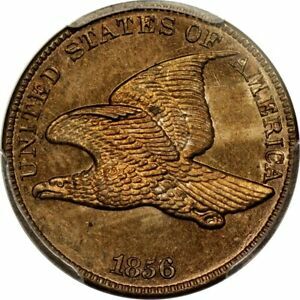 Flying Eagle cents have proved enormously popular over the decades, beginning with the pattern issue of 1856. 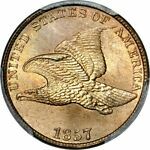 It is unclear exactly how many 1856 cents were struck, but the best estimates fall in the range of 800 to as many as 1,500 pieces. Both proofs and business strikes were made, as well as originals and restrikes. All are valuable and have been extensively hoarded over the years, the most famous hoard of which came from the estate of Colonel John A. Beck, who at one time owned 531 pieces. 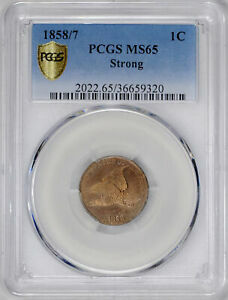 The 1856 Flying Eagle cent is one of the few American coins whose value is greater than its rarity. Worth more than $2,000 in Good condition, the 1856 cent has a value and interest to collectors of U.S. coinage that goes far beyond the more limited scope of "penny" collectors. Why? The only reasonable answer seems to be: because they always have been valuable. Even in the late 1850s, 1856 cents were worth a dollar or two depending on condition. It was Longacre's inability to engrave dies properly that led to the early demise of the series. A new design was needed where die opposition would not be a problem as it had been between the eagle on the obverse and the wreath on the reverse. It was this need that led Longacre to redesign the small cent for 1859, replacing the flying eagle motif with an Indian head. 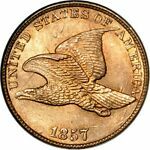 The original small cent design, however, gave collectors of 19th century U.S. coins a short, yet challenging series that continues to intrigue numismatists more than a century later. Breen, Walter, Walter Breen's Complete Encyclopedia of U.S. and Colonial Proof Coins, F.C.I. Press, Albertson, NY, 1977. Carothers, Neil, Fractional Money, A History of the Small Coins and Fractional Paper Currency of the United States, John Wiley & Sons, London, 1930. Snow, Richard, Flying Eagle and Indian Cents, Eagle Eye Press, 1992. Steve, Larry R. &Flynn, Kevin J., Flying Eagle and Indian Cent Die Varieties, Nuvista Press, Jarrettsville, MD, 1995.